Huayna Picchu is the striking mountain located behind the citadel of Machu Picchu. Shaped like a large cigar shooting directly out of the ground, Huayna Picchu makes up the background of the iconic scenery that you see in all the classic photos of Machu Picchu. Incredibly the Incas used the valuable land area on the mountainside to build many layers of agricultural terracing and storage houses. 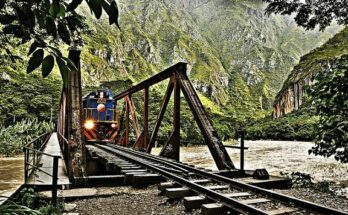 Visitors can follow an original Inca Trail to the summit of Huayna Picchu that leaves the north-westerly corner of the Machu Picchu citadel. Here are a few hints and tips you need to know about hiking Huayna Picchu. A few years ago, the official governing body of Machu Picchu limited the entrance to Huayna Picchu to just 400 people per day. Two entrance times where created, the first at 7 – 8 am (200 hundred people), and the second at 10 – 11 am (200 hundred people). 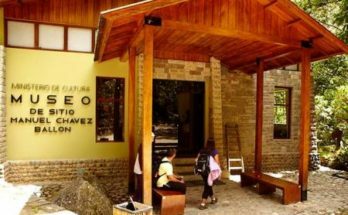 A few years ago, you could hike Huayna Picchu on a first come first served basis, but now you need to purchase an entrance ticket in advance. 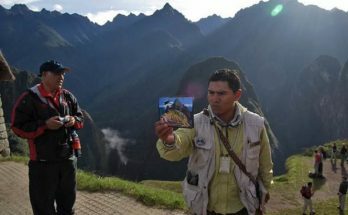 The ticket you need to buy is combined with the entrance to Machu Picchu, and costs about US$ 10 more. As ticket numbers are limited, it is essential to book in advance. Tickets during the festival of Inti Raymi, Christmas, New Year and Peru’s Independence Day (28 July) can sell out 4-5 months in advance. It takes between 40 – 90 minutes to reach the peak of Huayna Picchu, depending on your level of fitness. 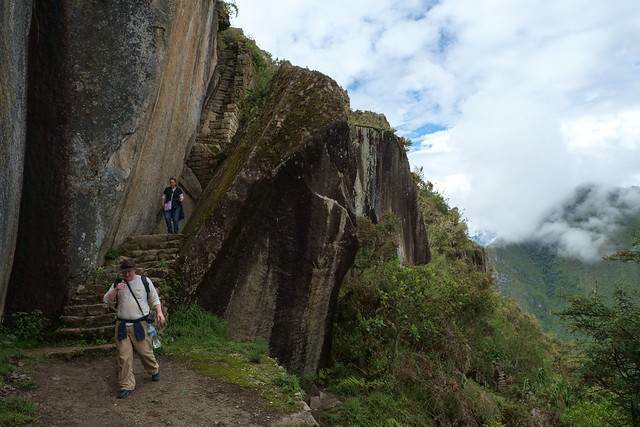 The path is an old Inca Trail, but in places it is very rocky and very steep. Take your time to rest on the way up, the views are incredible. At the very top space is limited, so you will probably only spend a few minutes there taking snaps of the all-important view of Machu Picchu. As you head down the mountain (a different route) there are several larger areas where you can rest and take even more photos. The hike down is a little quicker, but take your time and be sure footed. The very top of Huayna Picchu is made up of several large and bare rocks. Often this area (and mainly just this area) can be full of flying and jumping insects, many of which are ready to bite you. During some months of the year the insects can be quite intense, and this may limit your time at the very top. Be prepared with plenty of insect repellent to avoid any bites. Long light coloured clothing is also advisable. Further down the mountain (just 5 minutes) the intensity of the insects mysteriously lowers. Have no doubt that Huayna Picchu is not recommended for those with a fear of heights. It’s not so much the heights that you will reach, but more about the paths that you will encounter along the way. In places the trails can be very narrow and very steep. 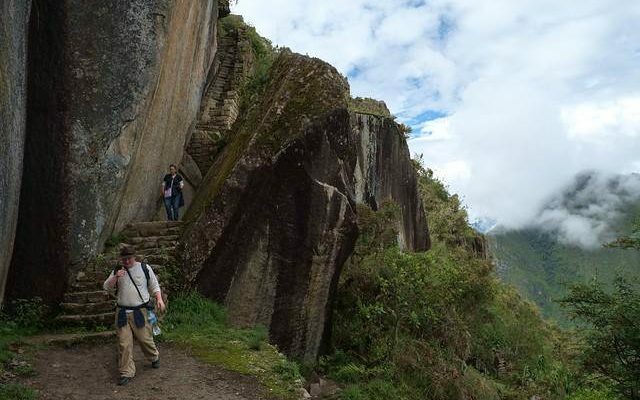 This is even more evident on the way down, as the trail follows original Inca steps, originally intended to interconnect the agricultural terraces; these steps are incredibly narrow, shallow and very steep more than 60 degrees). Don’t forget to take with you a large sun hat and make sure you apply plenty of sun block before you start the hike. Machu Picchu is located on the edge of the Amazon Jungle and the climate is tropical and often very hot. Additionally, at these high Andean altitudes the Sun can be extremely direct and will burn fair skin within a few minutes. Make sure that you take a bottle of water with you, and perhaps a few snacks to boast those energy levels on the way. Next Article When is the Best Time to Visit Machu Picchu?